In a bid to support Amalgamated Telecom Holdings’ (ATH) expansion plan in the Pacific, ANZ Bank yesterday signed a financing agreement. This financing agreement will allow ATH’s position as the telecommunications market leader in the South Pacific to grow through fully acquiring BlueSky Pacific Group. This covers operations in American Samoa, Samoa and Cook Islands as well as a smaller business in New Zealand. It adds to Suva-based ATH’s regional businesses in Kiribati and Vanuatu. 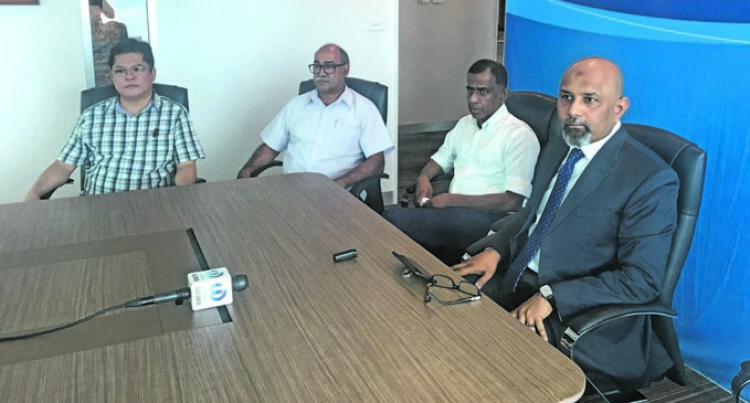 Speaking at the signing of a finance agreement, between ANZ and ATH, Saud Minam, ANZ Fiji Country Head said: “We are pleased to have been a central part of ATH’s expansion in the South Pacific over the past three years. “Fiji is the regional hub for ANZ and ATH. We’ve had strong economic growth here over the past nine years and the outlook continues to be strong. ATH chief executive officer Ivan Fong said: “We have a long banking relationship with ANZ, we have been quite pleased that ANZ has thus far been able to support ATH in its expansion journey which we started a couple of years ago. “For ATH, our track record in terms of bringing improvements both in infrastructure and services in the Pacific has been very positive for us and the end users of the services we provide. “ANZ is financing a large part and not all of it but its obviously a big investment. “The investor itself is required to front up some money, we need to have skin in the game so to speak. Large part of the requirement will be financed by ANZ Bank but not the overall transaction itself. “We announced in 2016, the enterprise value was US$79 million (FJ$166), for the acquisition of ample stake and that amount still remains. “We are in the final stage, which is roughly about US$40m (FJ$84m) which ANZ is financing out of the total. “The remaining is a mixture of ATH own funds and there is also a mixture of debt we have taken recently. “Almost three years ago now, that we announced our intent to expand in the Pacific. “Prior to 2015 we looked at Papua New Guinea and Solomon Islands but for various reasons we didn’t end up entering those markets. “But we had looked at Kiribati and made an investment in 2015. “So that’s worked out quite well for us in 2015 in terms of improving operations and service. “In 2016, we then acquired Telecom Vanuatu from Mauritius Telecom spent some time tidying up that operation and getting things working again. While at the same time in 2016 we announced the transaction and our interest to buy out BlueSky Group (55 per cent interest in BlueSky at the time). “The BlueSky group involves the operation in American Samoa, Samoa, Cook Islands and small operation in New Zealand as well. “We have been quite pleased that ANZ has been able to walk with us thus far in terms of financing and getting our infrastructure and upgrade on the ground. “The last few weeks as you have heard we have received all the approvals from the US authorities to complete the BlueSky transaction.